This mandala is on a much smaller scale than the others I’ve made. My back was still a bit sore from shoveling, so I stood at my potting bench rather than stooping and bending (not to mention, sitting on the cold ground in the snow 😉), so there wasn’t as much room to create anything very large. To give you an idea on the scale, the small pinecones around the center are about the size of the fingernail of my pinkie finger. They’re sooo tiny and cute! 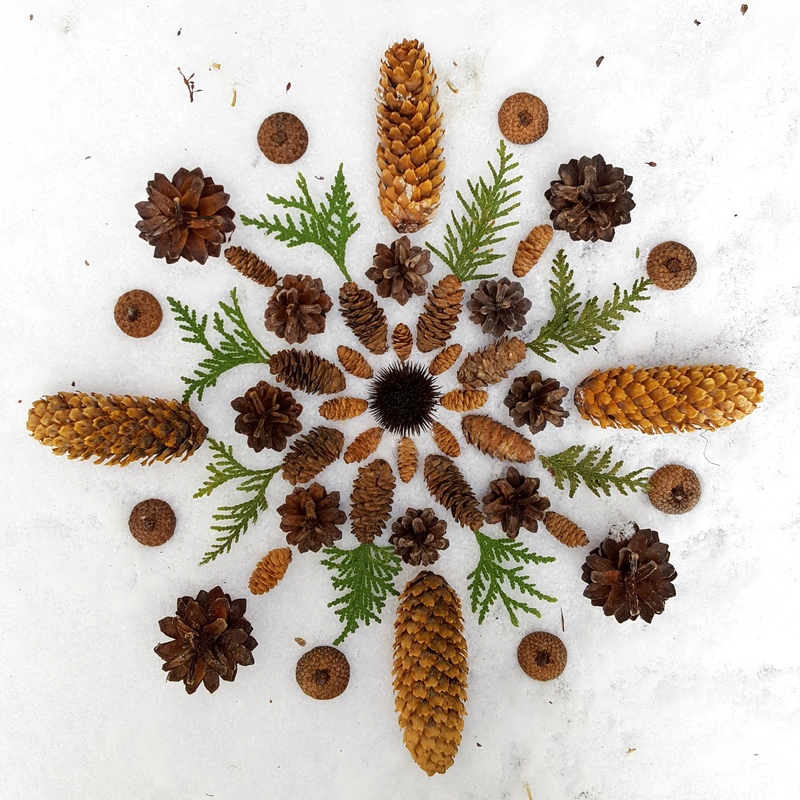 And here’s a little fun fact – I collected them (and the majority of the other pinecones I used in this mandala) while on a walk with my daughter while she was in labor. 😊 It wasn’t a very long walk, seeing as she was in labor, but clearly we walked past a wonderful variety of evergreens. I love all the various sizes and shapes of pinecones and was fortunate to come across so many of them in such a short distance. As the glory of the colorful leaves of the deciduous trees of autumn fades, various evergreens now take center stage. Extra lovely and so refreshing sprinkled with fresh snow. I love the scent of cedar and pine.